Downtown Wilmington is the Perfect Place to Start a Small Business! Is one of your goals for 2018 to start a small business? If you are an entrepreneur already, or have a great new business plan, Downtown Wilmington, DE is the perfect place to make a home for your business. With a current thriving small business community, new corporations and organizations constantly incorporating in the city due to the State's tax structure and hundreds of new residences currently being built there is so much opportunity within the city! Downtown Visions- From façade improvement to financial assistance guidance, Downtown Visions has several programs specifically designed for those desiring to start a new business in the city, check them all out here. Downtown Visions also has workshops and events for small businesses. To stay updated on upcoming events, be sure to subscribe and follow us on Facebook. Small and Minority Businesses and Tax Assistance- resources for small and minority-owned business as well as networking information can be found here. Programs through the City and State- A tax abatement program, relocation/workforce development assistance, Grow Wilmington Fund and loans, architectural and engineering feasibility work matching, technical assistance and more information on the Downtown Development District can be found here. Complimentary Business Advice with a Certified Mentor- and more, including complimentary workshops for small businesses, can be found here through the Score program. Starting your business and looking to live close by? Here are lots of great apartment communities right downtown! Small Business Saturday Deals Happening in Downtown Wilmington, DE! Downtown Wilmington kicks off Small Business Saturday with the Downtown Christmas Parade starting at 11AM. Afterwards, attendees are encouraged to stop by the Delaware History Museum for Free family activities and fun between 12:30pm-4pm . The Playhouse on Rodney Square has tickets on sale now for Rudolph the Red Nosed Reindeer playing on both Saturday & Sunday. We encourage all to shop small at our local retailers and restaurants. Below are just some of the retailers offering exclusive specials and promotions in celebration of Small Business Saturday! Black Friday & Small Business Saturday Sale: Free gift with purchase of $50 or more, plus, 10% off all artwork by Motion Illustrationz! Did we mention free coffee and donuts?! 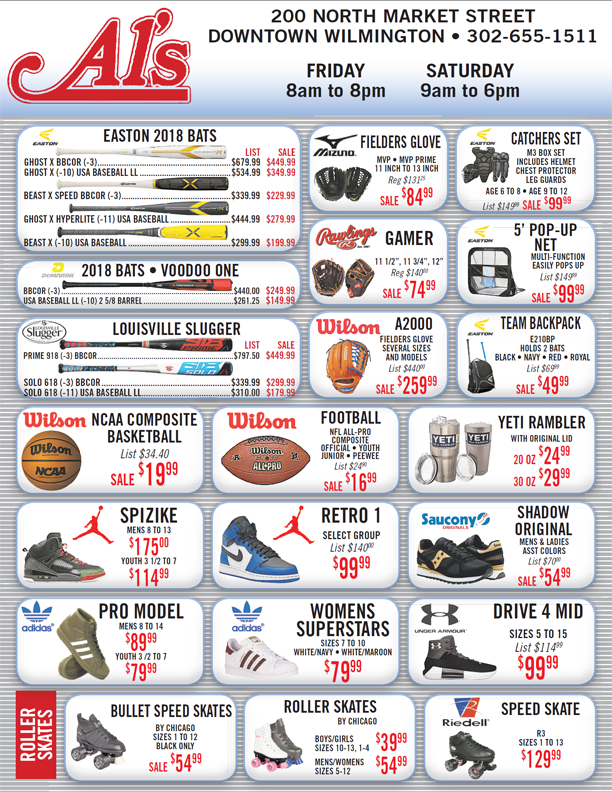 Thanksgiving Weekend Sale: Tons of athletic equipment at DEEP discounts. Check out their ad for more INfo! Buy $100 in gift cards, receive a free $20 gift card! Free $50 gift card with the purchase of any $50 gift card! FREE Admission during Small Business Saturday and December Art Loop. Shop the Museum Store for unique Delaware gifts while you're there! Buy a gift membership to DMNH, and get two free guest passes! Two-Day Holiday Auction & Sale: Bid on original folk and abstract paintings by multi award-winning folk artist Eunice LaFate! Mugs, t-shirts, resin, jewelry, sculptures and note cards also available. $1 any-size drip coffee, plus, a FREE LOMA Coffee mug with a purchase of $25 or more during Small Business Saturday! Receive a $30 gift card for only $25! Mention this ad and save $20 off purchases of $100 or more! This annual holiday bash benefits Wilmington families IN need AND brings together more than a dozen local artists and artisans for last-minute gift buying opportunities! Gift certificates for OperaDelaware's 2018 Festival make excellent holiday gifts and are available from $50-$200! Starbucks on Market Complimentary live music following the parade. Free Single Scoop Voucher for every $25 spent in store (gift certificates available in $5 increments!) during Small Business Saturday! $1.50 coffee drinks, any size, every Monday, all day! Mocha Latté, Cappuccino, Espresso, Machiatto, Coffee, and more. All from La Colombe coffee roasters. This marketplace during Small Business Saturday focuses on women-owned businesses and their products on display at The Delaware Contemporary! We Want to Help YOU Prepare for Small Business Saturday! Hard to believe, but the holidays are right around the corner! What is your business doing to properly prepare? Did you know Downtown Visions is here to help grow your business? In addition to all of our business resources, we are huge fans of Small Business Saturday on November 25th. We want to help you have an extra successful Small Business Saturday and encourage locals to #shopsmall. In order to help you, please send us whatever promotions you will be offering on that day and we will help get the word out! Simply email LSchweiger@downtownvisions.org the name of your business, the promotion you are offering, how to redeem that particular promotion and what hours you will be open that day.